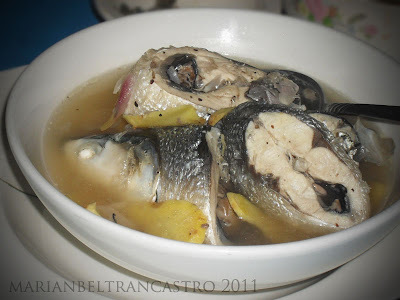 Paksiw na Bangus (Milkfish in Vinegar Sauce) by Maryanang Garapones! Wash and clean your bangus. Remove the gills but not the scales. Rub them with salt and wash with running water. In a casserole place the sliced bangus, pounded garlic, sliced onion and ginger, some salt and water and of course, the vinegar. Cover and let it simmer for about ten minutes. Before cutting the fire add the siling haba.